An open invitation to a free , introductory workshop to an art for increasing consciousness and skill. Geraldton PCYC, 105 Pass St, Wonthella. 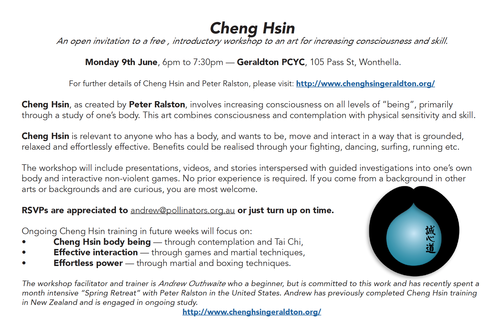 Cheng Hsin, as created by Peter Ralston, involves increasing consciousness on all levels of “being”, primarily through a study of one’s body. This art combines consciousness and contemplation with physical sensitivity and skill. Cheng Hsin is relevant to anyone who has a body, and wants to be, move and interact in a way that is grounded, relaxed and effortlessly effective. Benefits could be realised through your fighting, dancing, surfing, running etc. The workshop will include presentations, videos, and stories interspersed with guided investigations into one’s own body and interactive non-violent games. No prior experience is required. If you come from a background in other arts or backgrounds and are curious, you are most welcome. RSVPs are appreciated to andrew@pollinators.org.au or just turn up on time. • Effortless power — through martial and boxing techniques. The workshop facilitator and trainer is Andrew Outhwaite who a beginner, but is committed to this work and has recently spent a month intensive “Spring Retreat” with Peter Ralston in the United States. Andrew has previously completed Cheng Hsin training in New Zealand and is engaged in ongoing study.